Description: Dar es Salaam is a major African city with more than 3 million people. Unless you have a particular reason for spending some time in Dar, we feel it just doesn’t fit in well with most itineraries. Due to the timing of flights, we do occasionally recommend overnights in Dar. The best bet for a half-day in Dar is to head to Mwenge where there is some good souvenir shopping, especially wood carvings. And near there is the Makumbusho Village Museum where you can find a collection of authentic homes from 18 Tanzanian tribes. 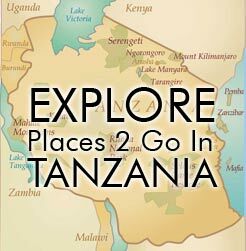 You can get a short tour and a broad overview of village life in Tanzania. There are also some decent beach hotels in/near Dar es Salaam, but for anything more than a 1 or 2 night visit, these are mostly outshined by nearby Zanzibar, which is where most people go. Near Dar, just a couple hours north, is Bagamoyo. This is a laid-back large village that has several very nice beach hotels.